A new generation of Battery Care Systems has arrived. A professional switch mode charger designed to automatically maintain, optimise and prolong the life of any 12 volt battery. Suitable for all 12V battery types up to 20Ah including Gel, MF and conventional lead and refillable batteries. The Oximiser 900 can be left permanently connected to provide long-term battery care. This sophisticated battery management system provides real time information about the battery condition. Heavily discharged batteries as low as 4.1 V can be charged if the battery is not damaged. I pick up a new bike Saturday and I think it has a usb connection for charging. Is this suitable? A USB port on a bike will be for charging items such as mobile phones, and will be for output only. The Oximiser will come with a battery connection lead. What length are cables that come with this, ie mains plug to charger and charger to bike. Also what difference between this and aniversary edition, same price except for a few coloured buttons on front ? The measurements are approximately 34 inches from the plug to charger, the lead from the charger to the connector is around 37 inches, and there is around 12 inches length on the battery connection lead. There is no difference between this and the Anniversary Edition. Is this charge suitable for Lithium Batteries. I have read some manufacturer statements saying as long as they are not left on for long periods and the chargers don't charge at 15+ volts they should be fine? 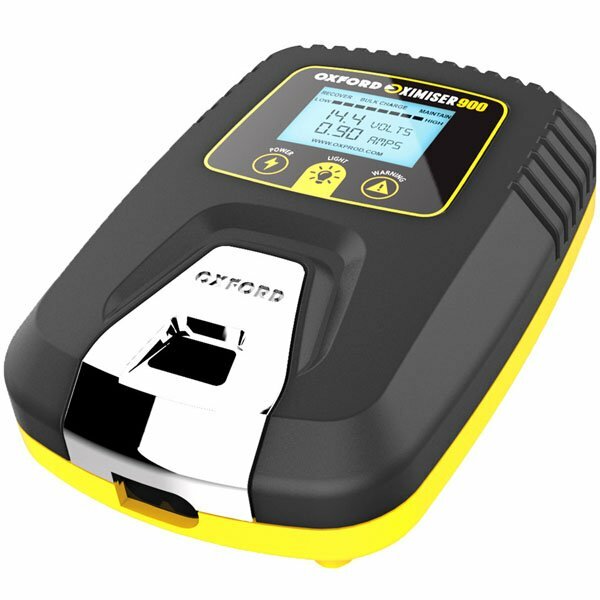 The only Oximiser that Oxford list that is suitable for lithium LifePO4 batteries is the 3X, and so we would not recommend using the Oximiser 900. Can you use with DDA socket? This cannot be used with a DDA socket. The Oxford battery chargers use the TM connections, but will come with a battery connection lead. Can this oximiser be used with VRLA (valve regulated lead acid) battery, many thanks. The Oximiser 900 can be used for VRLA type batteries. I have a battery that says 'no quick charging' on it (https://www.batterylookup.com/Yuasa/GS_GT12B-4~), can I still use this charger/tender? I plan on taking the battery off the bike and leaving it on the charger for the winter. Thanks. The Oxford Oximiser will be fine to maintain your battery. Does this come with a EU plug too? The Oximiser 900 is supplied as standard with a UK plug only. We can confirm that the length of the wire (not including the plug) is approximately 34". How are these with the outdoors? If I were to use it in my shed that doesn't offer a sealed environment away from the cold, would it cope? I bought this item and connected it up. It charges on bulk charge 0.87 amps then drops to maintain at 0.25 amps. I left it on for two days, the battery shows 12.8 volts plus, but it won't turn the engine over enough to start. If I use my old style car charger it will charge up ok but doesn't hold the charge for more than a few days even with the oximiser attached. Any advice? We would suggest either replacing your battery or asking an Auto-Electrician to check your regulator/rectifier. Can you buy a 2nd set of connectors to be left on on a 2nd bike. Can the optimiser 900 charge through a power socket (cigarette lighter type) if the socket is not wired through the ignition switch and has a separate fuse? No, this unit does not come supplied with a 12V socket connection, only crocodile clips. I have a 900 optimizer and its charging fine but what does "Bulk Charge " mean? Can I double check it will revive a flat battery? I would also like to know how it fits to the bike? Optimisers can not always revive a flat battery as this will depend on how much it has already been discharged. ( Heavily discharged batteries as low as 4.1 V can be charged if the battery is not damaged. The unit fits to the bikes battery via terminal leads which can be stored under the seat or fed through part of the bikes frame for easy access to the mains lead. I have bought a new battery and need pour in the acid to activate it and then charge it. Will this charger work for this purpose? This will be fine - let the battery stand for an hour before charging, and leave the cap off while charging for the first time. Plugged my charger in after bike was standing for two weeks bike didn't start so plugged in to give it a top up.. kept flashing 10.2 volts for two hours.. took battery in to bike shop to check.. charged it 100%.. just don't understand why my oximiser wouldn't do it?? The Oximiser is designed to be plugged in and left on to maintain a battery,and so should really have been plugged in before leaving the bike for two weeks. The charger will go through cycles(recover, bulk charge and maintain) and two hours would not be long enough to give the battery a full charge. If this had been left on over night you should find that the battery would be fully charged. Can you leave it on all over winter? The Oximiser 900 can be left permanently connected to provide long-term battery care. Do Oxford have a charger that can be used on both cars and bikes? The Oxford Oximiser 3800 is capable of charging batteries from 1.2Ah up to 125Ah making it capable for car applications. Does it mean you can connect it to your bike whilst you are riding it, or just when it is in storage? 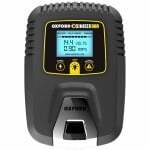 The Oxford Oximiser comes supplied with a connection wire which can be permanently attached to your battery. The wire leading from the battery ends in a connection point which can be placed in a convenient position such as under the seat etc. This allows you the convenience of connecting directly to the Oximiser when the bike is not in use and then disconnecting before you go out on the road.